Measuring 460km in length and 80km wide, Vancouver Island is the largest island on the American side of the Pacific and is located just off the southwest coast of British Columbia on the border with USA. It has the mildest climate of anywhere in Canada, with winter temperatures at the coast usually remaining above 0°C. Parts of the west coast are, however, also the wettest places in North America, with Lake Henderson recording over 6500mm of rain annually! Not many people have a concept of just how much rain 6.5m is. By comparison, northwest Scotland, the wettest area in the UK, generally gets less than 3000mm annually and only 1600mm falls on west Wales! The east coast is considerably drier with Victoria and the Saanich peninsula only recording 650mm, which is comparable with the rainfall of London and Edinburgh. 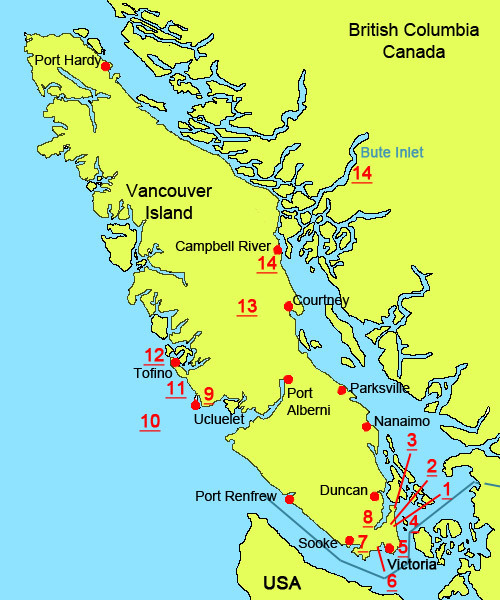 In contrast to Britain, however, the vast majority of the rainfall in Vancouver Island occurs in the winter months and the summers are generally quite dry and warm. The wildlife present on Vancouver Island is unsurprisingly very similar to that found in mainland British Columbia, although there are a few notably absent large mammals, such as Grizzly Bear, Porcupine, Moose and Coyote. Bird diversity is not huge but you can easily see over 120 species in a 3 week trip. The clickable map below shows the rough locations of all of the main sites I visited.